Build a new adventure with Bibleman (TM)! 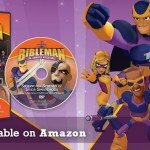 Are you ready to join Bibleman and his team and take up the armor of God? Start with this 227-piece building block set, which comes with its own Bibleman mini figure. Compatible withother popular building bricks, this set lets you build the Bibleman van and recreate each heroic adventure!"